1. There is a strange and/or horrific attack (or incident) in the shocking prologue. 3. Mystery clue dropped as to Peter's background and nature. 4. Olivia investigates the case-of-the-week and ties it to "the Pattern," after making mention of her relationship with Agent Scott. 5. The case of the week involves something paranormal or "fringe" Dr. Bishop worked on once directly (but because of his cutesie-poo insanity has conveniently forgotten about, until it comes up in this new context). Also conveniently, Bishop knows of a functional device built just for solving this case. Deus ex machina alert! 6. Case leads back to Massive Dynamic. 7. Olivia interviews Blair Brown's character at Massive Dynamic, and she "denies all knowledge." 9. Epilogue: something's going on with John Scott (Mark Valley), the dead FBI agent. This week's episode, "The Arrival" -- the best tale of the series thus far -- adheres mostly to this by-now overly-familiar formula, but also breaks away a little. Enough, anyway, not to make the hour a total bore. First the bad. There is indeed a horrific incident in the opening prologue (a subterranean missile pops up at a Brooklyn construction site and causes massive damage; #1). Dr. Bishop again has his trademark cutesie-poo insane moment, here over his desire for a root-beer float (#2). Also, there is a mystery clue dropped about Peter's background (#3), the case ties back to the Pattern and somebody makes mention of Olivia's relationship with Agent Scott (#4). Also, Dr. Bishop has previously been associated with this case (as we learn in "The Arrival's" denouement; # 5). Finally, the episode ends with a nod to Agent Scott's condition (#9). However, last week I looked to Fringe -- challenged it, really -- to break the mold in even one of the above nine categories. And if I'm being objective here, I must note that in "The Arrival," it did just that. To wit: Blair Brown did not guest star this week; and the case (of the subterranean torpedo...) did not lead directly back to Massive Dynamic. Actually, as I noted above, I liked this episode the best out of the four I've watched so far. The mystery is genuine (the origin and nature of the torpedo...), and furthermore, there's no rush to solve the mystery in forty-five minutes. The secrets of the device remain ambiguous to say the least, and I appreciate the restraint. I hate being spoon-fed explanations all the time and much prefer a slow-building, multi-faceted mystery. I was also fascinated in "The Arrival" by the presence of "The Observer," a bald, hairless "watcher" who mysteriously appears at Pattern-related crime scenes. I don't know if "Mr. No Brow" (as Peter calls him...) is an alien, a time-traveler (from the future) or an emotionless android, but the presence of this mind-reading figure added significantly to "The Arrival's" narrative. Hero? Villain? Impartial witness? I'm very curious to find out. Finally, Fringe is proving interesting. Also, Joshua Jackson -- the standout performer on the series -- was awarded with a more substantial part in "The Arrival." I'm not talking about his predictable "should I stay or should I go" dilemma, but rather his conflict with his father, which results in what we see in this episode: a real love/hate relationship. I'm glad the makers of Fringe are also giving Peter some new duties as a "civilian consultant to the Department of Homeland Security," because in the last three episodes the character as pretty-much wasted on exposition or wise-cracks. Also, some mysteries of Peter's background are solved here. That's all I'll say, in case you haven't watched the episode yet. In toto, "The Arrival" seems like a step in the right direction for Fringe. Like Mr. No Brow himself, I'll continue to "observe" the series next week; and hope that it continues to rely on only five or six out of the nine conventions which have appeared in episodes thus far. I read today that the series has been picked up for a full season. 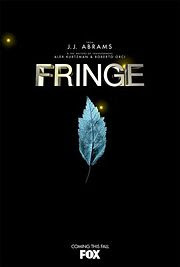 That gives Fringe adequate time to improve, I hope. Very nice blog. Congrats on your literary sucess! I'm trying to start up a movie review social network. It's brand new (as in I'm currently the only member) but I wanted to invite you to check it out.